This U.S. government shutdown is going to do a number on the tourism industry, since all national parks, monuments, and historic sites are closed. And while NASA, the space agency, is also closed, it’s important to note that Kennedy Space Center near Titusville, FL is still open. The Visitor Center Complex is managed and operated by a private concern, Delaware North Companies Parks & Resorts, and not funded through public monies. 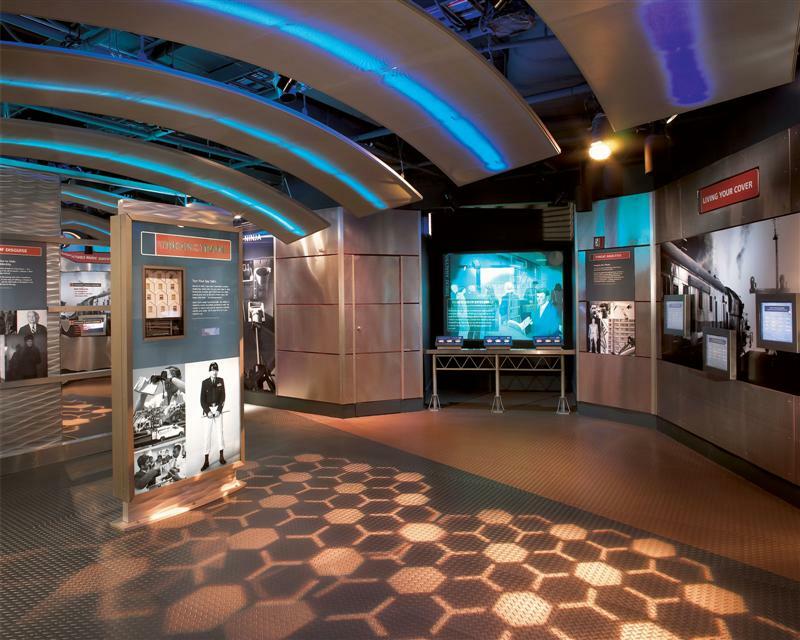 There are a few services within the attraction, such as the KSC Bus Tours and the KSC Up-Close Tours, which won’t run until the furlough is over, but there is still a full day’s worth of activities you can enjoy. This summer, we visited NASA’s Kennedy Space Center because it’s home to three world’s largests: the world’s largest twin IMAX® theater; the world’s largest collection of personal astronaut mementos; and the world’s largest store for space-related memorabilia. It’s a smart strategy to consult the visitor complex map to make a plan for your day. We scheduled our day around the astronaut meet-and-greet. 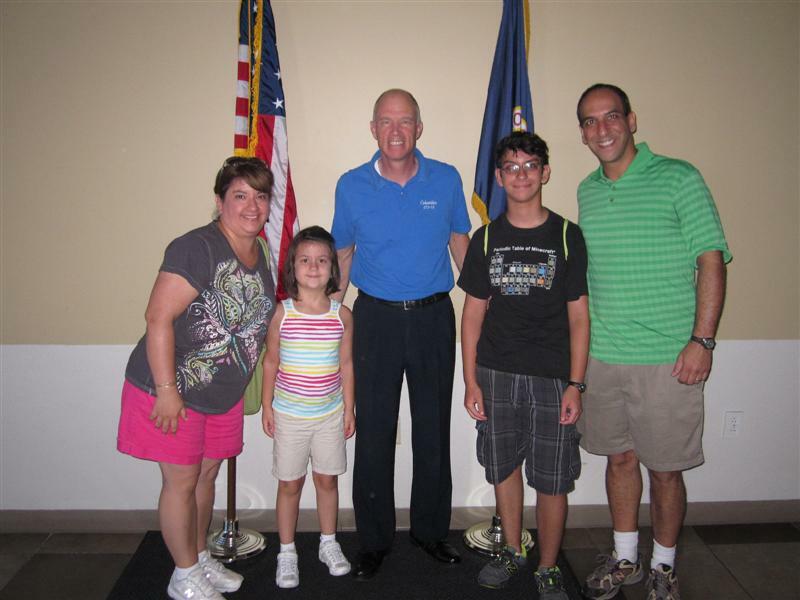 One of the biggest highlights for us as a family was the chance to meet astronaut Rick Searfross following his presentation at the Astronaut Encounter Theater, during which he described his experiences piloting three space shuttle missions. Translating that from Geek to English, we met Santa Claus, the Dalai Lama, and Bruce Springsteen, all rolled into one. Meeting former astronaut Rick Searfross, and trying to keep it cool. We actually didn’t get the chance to see a movie in the world’s largest twin IMAX® theater, because we had two other priorities: Space Shuttle Atlantis and the Angry Birds Space Encounter. My brother Mike gets the award for the most comments made on GBOGH posts…seriously, I sent him a plaque. So it was only a matter of time before I cajoled him into writing a guest post. After all, he’s a dad now, and has started traveling with his two adorable kids. Having enjoyed a great deal of spontaneous, child-less travel for many years prior to the birth of our children, we were struggling to find any opportunity for travel with the entire family that wouldn’t leave us feeling completely disenchanted about future travel altogether. New Orleans somehow presented that opportunity to us. 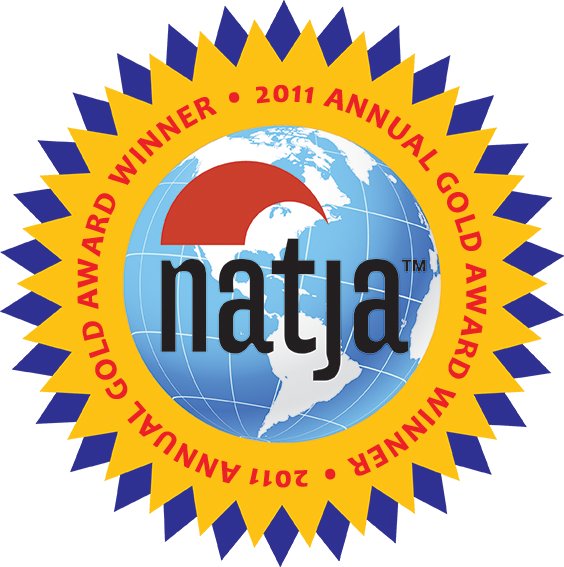 Flights were inexpensive, flight time was limited to one hour, and we had a condo available at no cost. 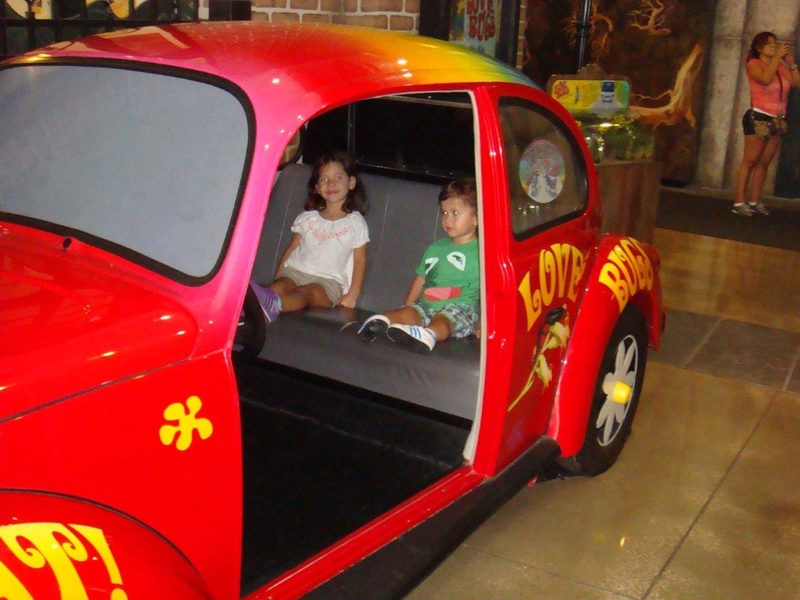 We knew that even if this first trip with children quickly melted down, we had invested very little. Plus, at only an hour flight away, we could realistically threaten packing up and heading home if everyone wasn’t behaving. 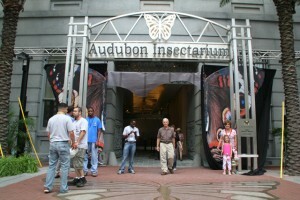 One very bright spot in an otherwise limited selection of children-friendly options in New Orleans was the Audubon Insectarium. My 3-year old daughter and almost 2-year old son said they wanted to see bugs, and we were all too happy to oblige them, as it was September in New Orleans, and it was 147 degrees (Seriously. Go back and check the records.). Two reasons: 1) We had heard multiple, very positive reviews (and it lived up to expectations); 2) a travel blogger who writes about BIG things, and will remain nameless, may have suggested that the New Orleans Audubon Insectarium is the country’s largest and therefore worth a visit. I knew we were going to love this place when we were met out front by an insectarium employee running insect races around an official Bug Track. Each child picked an insect that was released and wildly cheered on. Good stuff. This VW Bug was set up in the middle of the impressive beetle display. We turned around and my son had found his way to the driver’s seat and was on his way. Not to be left behind, his sister quickly joined him on his quick “drive” around New Orleans. 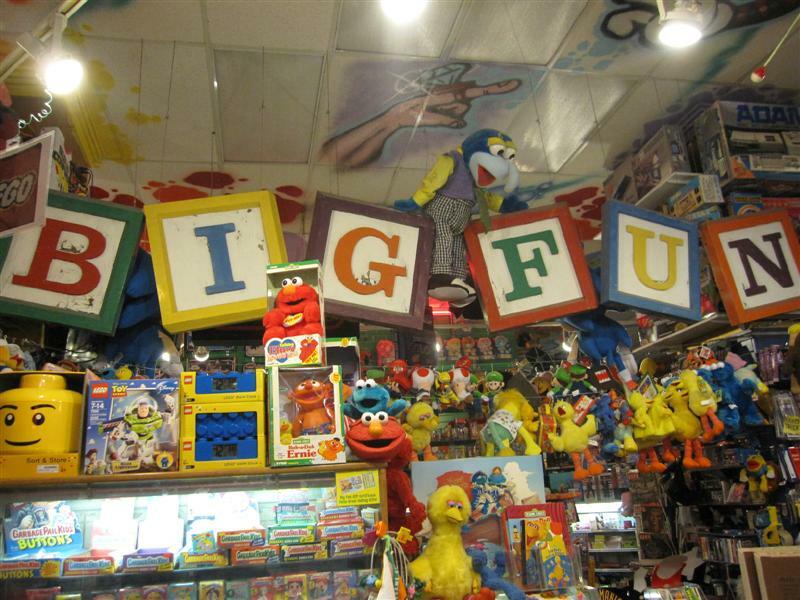 I included the Big Fun toy store on our Cleveland itinerary for its name, obviously. It’s not the world’s largest toy store (that would be the Toys R’ Us in Times Square), but it lives up to its name by giving you a really enjoyable trip down memory lane! 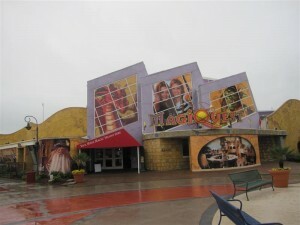 Big Fun, which has been around for almost 20 years, has two locations. We went to the one in the Coventry neighborhood. 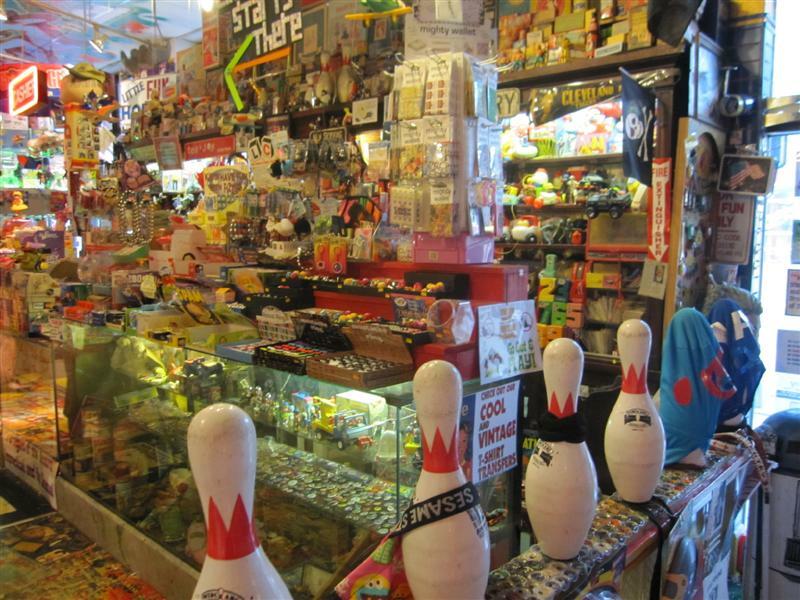 Both are stuffed to the brim – literally from floor to ceiling – with an amazing array of toys, collectibles, novelties and gag gifts. Picture it: Orlando. Summertime. A heat-phobic family of nerdy tourists needing somewhere to escape. 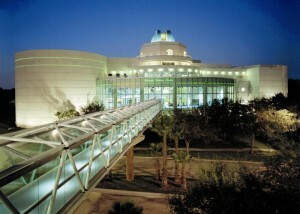 Orlando Science Center to the rescue! Orlando is not only theme parks, a fact which I urge everyone to consider when they visit. There are some really fun attractions which have nothing to do with a certain mouse and his friends. 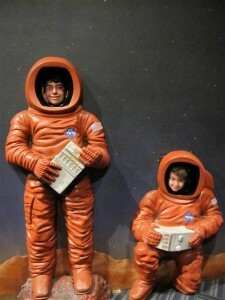 Because we proudly fly the geek flag on our homestead, we’re always up for a visit to a science museum. The OSC lured us in with its promise of the world’s largest Digistar Planetarium. 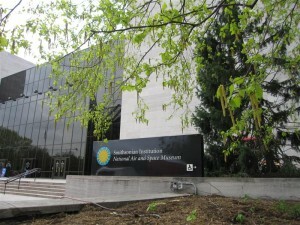 The Planetarium was our last stop, after visiting the center’s other exhibits. 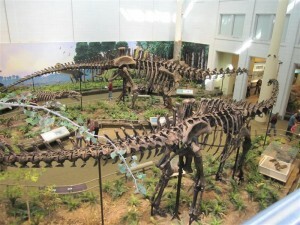 The kids enjoyed the “DinoDigs” exhibit gallery features several reproduction skeletons of dinosaurs and prehistoric sea creatures, including a T-Rex. Two fossil dig areas attracted a gaggle of kids clamoring to find dino bones. The Girl especially enjoyed being with other pre-schoolers in KidsTown, where she spent an inordinate amount of time at the water table and in the pretend orange juice processing plant. Remaining relatively dry at the water table. BEST GIFT SHOP EVER! Okay, now that I have that out of the way, let me tell you about one of new favorite museums. 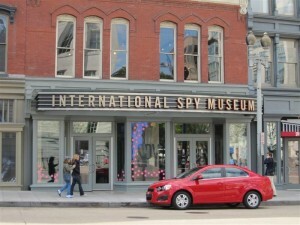 While in DC over spring break, we visited the International Spy Museum, home to the world’s largest collection of espionage artifacts. 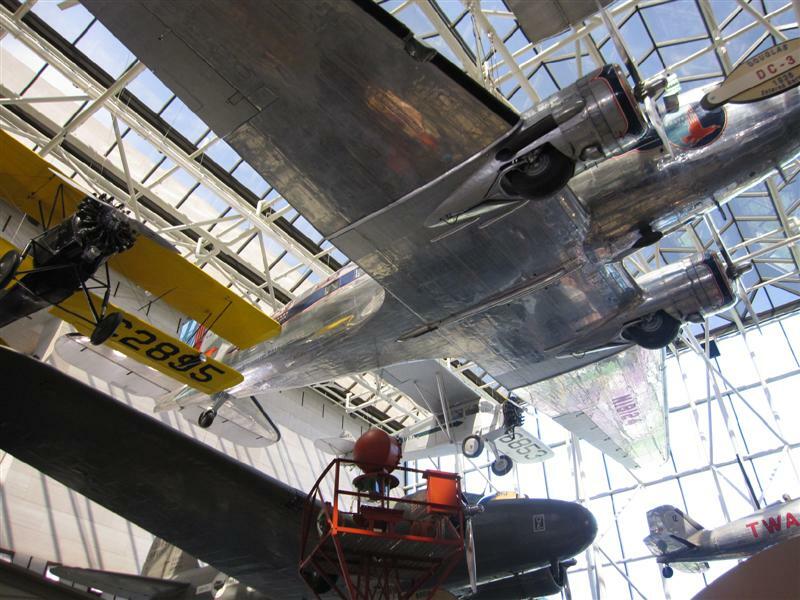 We also visited the Air and Space Museum, so we continued in the vein of geeky, techy adventures. Both kids have watched all four movies in the The Spy Kids series multiple times, and wish they were Carmen and Juni Cortez. (Which would make me Carla Gugino in a black leather get-up. I could live with that.) Naturally, The Girl wants to be a spy when she grows up. Considering her skill at lying with the face of an angel, I would say she has a good shot. If you are even slightly intrigued by spies, their gadgets, and their undercover adventures, you will love this place. When you arrive, you choose your “cover,” adopting a name and back story. The Boy took this task seriously, writing down all the details of Yuan Zheng, the 39-year old dentist he had become. Most of the museum experience is passive – looking at the collection of espionage artifacts behind glass. But I found the displays of disguises, weapons, invisible ink, and buttonhole cameras really intriguing. You can also watch videos describing different facets of espionage, like surveillance and picking locks. Illuminated screens play a far larger role in my family’s everyday life than I care to admit. So I was sure that the tip I got from Mara at Mother of All Trips would result in a memorable stop during our Philadelphia weekend getaway. She suggested we visit the Comcast Center, for a look at the “Comcast Experience” wall. This image is displayed on only the top half of the screen. The panels below aren't really panels, they're video replicas of the room's actual wood panels. 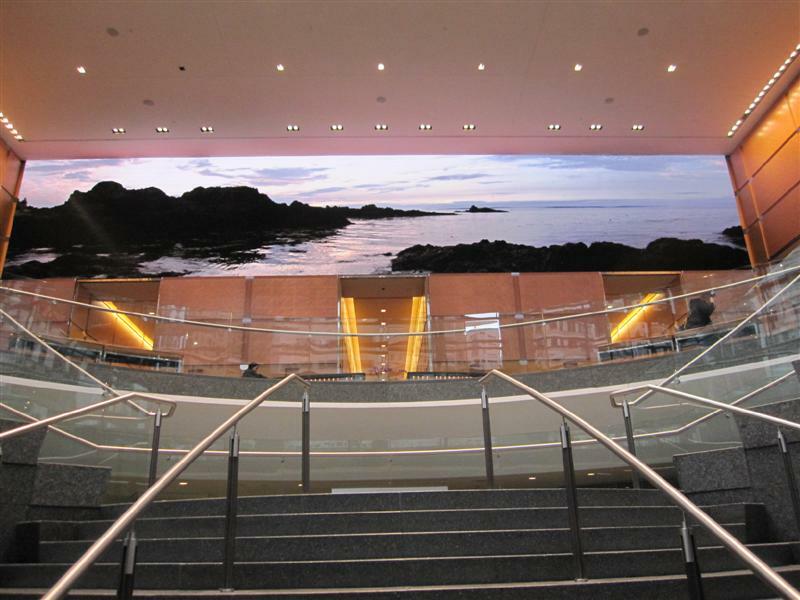 The 2,100-square foot HD video display wall is the world’s largest four-millimeter LED screen. For 18 hours a day, you can watch various short films; original programming created exclusively for this screen, which measures 83.3 feet wide and 25.4 feet high. I married a geek. Three years later, I gestated his miniature. So it’s not a stretch to say that the world’s largest robotics exhibit would be something of interest to these two. But here’s the thing. 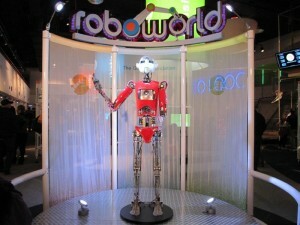 Even if you’re not a geek (or haven’t outed yourself yet), you’re still going to love roboworld™, the world’s largest permanent robotics exhibition, at the Carnegie Science Center in Pittsburgh. 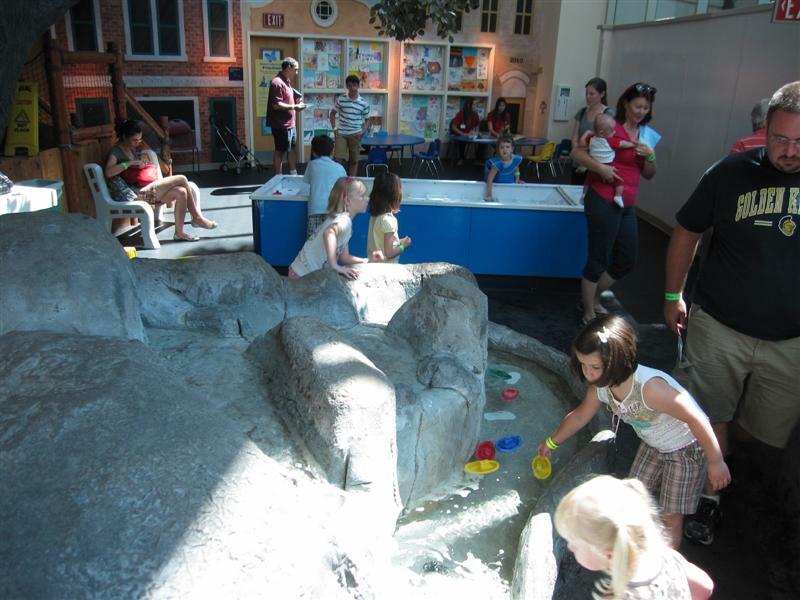 On our road trip to Pittsburgh, PA last week, the four of us spent the morning at the Carnegie Science Center. NOTE: A single morning was not enough time. I hated myself for having to rush the kids from exhibit to exhibit. Did you know that there’s a $500 billion emerging robotics industry in southwestern Pennsylvania? Pittsburgh, then, was the natural location for roboworld, which opened in 2009. This $3.5 million exhibition occupies 6,000 square feet, with three distinct areas featuring robots sensing, thinking, and acting. 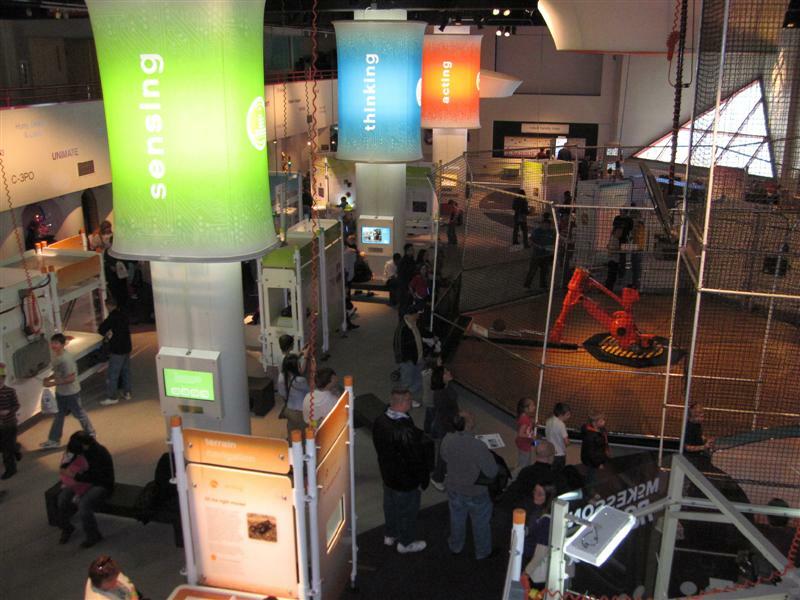 The Science Center is four floors of pure geek revelry, but roboworld is on the second floor. You’re greeted by Andy, the life-sized RoboThespian™, who you can program to speak and move via touch screen. Along one whole wall is a robot Hall of Fame showcasing robot replicas from popular movies and TV shows spanning several decades. 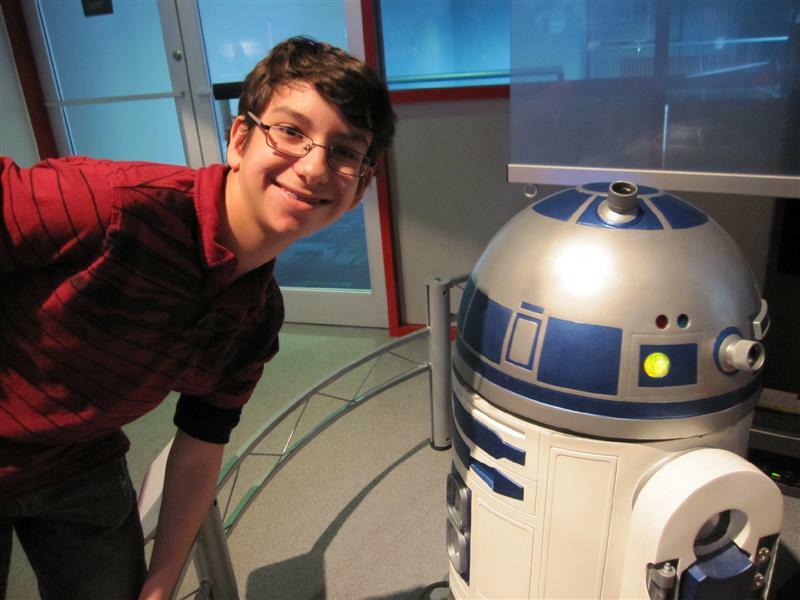 The Boy was overjoyed to see C3-PO and R2-D2, while Matt and I related more HAL 9000 from “2001: A Space Odyssey,” and Robby from “Forbidden Planet”. "Can I trade my sister for this?" Practically every exhibit had some interactive component, so you could spend hours just in roboworld. (But you do want to leave time for the other exhibits, especially the model train village right next door).